What Is the Difference Between an Inverting & Non-Inverting Amplifier? An electronic amplifier boosts the current or voltage of an incoming signal. These devices come in two forms. A non-inverting amplifier's output follows the input voltage exactly. An inverting amplifier shifts the input 180 degrees, so positive values become negative and vice versa. An operational amplifier combines both types in a single convenient package. Electronic engineers created a packaged circuit called the operational amplifier, or op-amp. It performs many basic amplification tasks in a format with only three connections: an inverting input, a non-inverting input and an output. Electronic designers treat the op-amp integrated circuit, or IC, as a “black box,” and need to know only its general behavior, not the details of its internal parts. Designers can use either the inverting or non-inverting inputs, or both together, depending on their goals. The inverting input reverses the sign of the input voltage, so a positive voltage at the input appears as a negative one at the output. For some applications, the sign of the output voltage does not matter, so the engineer may choose to use the inverting input if it simplifies a circuit design. For other uses, such as cancelling a positive voltage with a negative one, the inverting input allows a circuit to remove signals selectively. 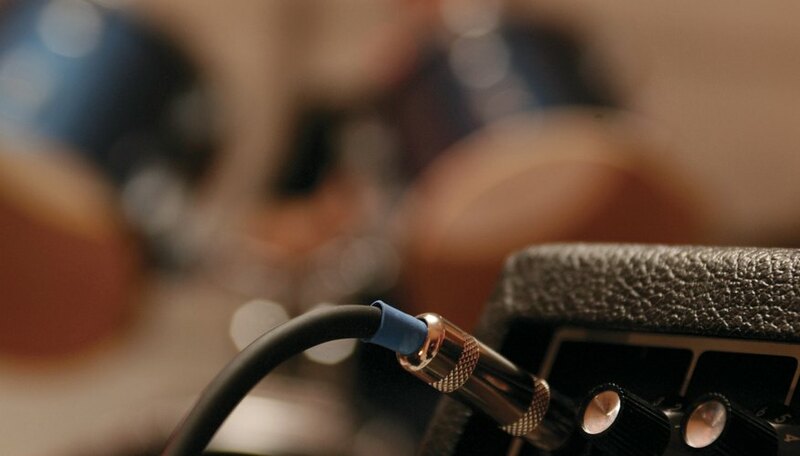 The inverting input also accepts feedback from the amplifier’s output. With no feedback, an op-amp has infinite gain, or amplification potential, so any positive signal drives the output to the amplifier’s positive supply voltage. This useful process also produces severe distortion. Feeding back a portion of the signal to the inverting input reduces gain to a reasonable figure and allows for accurate signal reproduction. Whereas the inverting input produces a “mirror image” of the voltage at the output, the non-inverting input produces an amplified copy at the output. The non-inverting input enables a designer to reproduce signals as closely as possible. A direct current, or DC, signal, for example, is more sensitive to a reversed sign than an audio signal, so a designer will likely choose the non-inverting input for DC. Unlike the inverting input, the non-inverting input typically does not accept feedback, which would increase a gain factor that is already infinite. Among an op-amp’s many tricks, it can combine signals. An audio engineer uses a multichannel console to mix the microphone signals from vocalists and instruments. At the heart of the mixer, an op-amp adds the signal from each of the mixer’s microphone inputs to produce the song with all its parts properly balanced. The op-amp can add signals from either of its two inputs. When multiple sources arrive at the inverting input, they add together before they invert. Those that arrive at the non-inverting input simply add together. The op-amp then subtracts the total of the inverted inputs from the total of the non-inverting inputs. The combinations of different inputs give the designer flexibility in creating circuits.